Luxury self-contained accommodation with breathtaking 360 degree views across the DÉntrecasteaux Channel to Adamson’s Peak. Add the St.Imre Vineyard to your to do list! Experience the natural beauty of Tasmania’s Huon Valley at The Peninsula Experience. Just over an hour south of Hobart, this luxury accommodation is suited to couples or small groups. The property is set on a private peninsula, less than five minutes from the fishing village of Dover. It occupies 250 acres of grassland, forest and wildlife to explore with 360 degree views across the D'Entrecasteaux Channel to the snowy peaks of the Hartz Range. There are two luxurious accommodation options on the property. The Cape House is a renovated turn of the century farmhouse with breathtaking views. It features a spacious lounge and dining area with a wood burning fireplace and a fully self-contained gourmet kitchen. It has three beautifully appointed bedrooms and two deluxe bathrooms. You can also enjoy the night sky from your heated outdoor Jacuzzi. Alternatively there is the newly completed Boat House, an exclusive hideaway for two. It includes a king size bedroom and a luxurious bathroom. There is a contemporary styled lounge and dining area with spectacular water views. These views can be enjoyed from the expansive deck which is complete with a sunken hot tub! This accommodation option is also self-contained with a fully equipped kitchen. The Peninsula Experience is a unique and private getaway set in a magical location. 1 hour and 20 minute drive from Hobart. 55 minute drive from Hartz Mountains National Park. No refunds will be offered for cancellation within 14 days of arrival. Confirmation and receipt of payment will be forwarded by email. Please note that bookings for dates 23 December - 10 January inclusive are NON-REFUNDABLE with payment in full to be made at least 30 days prior to arrival. Experience ultimate luxury and seclusion in a truly magical setting surrounded by 250 acres of rolling hills, forest and wildlife. The Peninsula Cape House offers breathtaking 360 degree views across the D Entrecasteaux Channel, from Bruny Island and Port Esperance Bay to the magnificent mountains of La Perouse and Adamsons Peak. The stunningly renovated turn of the century farmhouse features huge lounge and dining areas with a wood burning fire and a fully equipped modern kitchen, complete with fully automatic espresso coffee machine. One luxurious bedroom with a king bed, a deluxe bathroom and an expansive timber deck with private barbecue and heated outdoor Jacuzzi. Enjoy a hot tub under the stars or a handpicked Tasmanian wine by the fire in this stunning farmhouse on the Peninsula. Please note: the second and third bedroom are simply locked off during the guests stay. Experience ultimate luxury and seclusion in a truly magical setting surrounded by 250 acres of rolling hills, forest and wildlife. 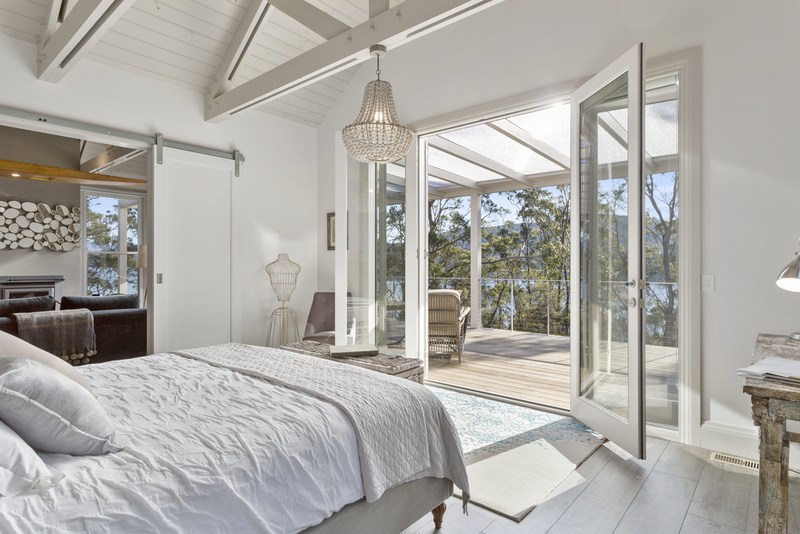 The Peninsula Cape House offers breathtaking 360 degree views across the D Entrecasteaux Channel, from Bruny Island and Port Esperance Bay to the magnificent mountains of La Perouse and Adamsons Peak. The stunningly renovated turn of the century farmhouse features huge lounge and dining areas with a wood burning fire and a fully equipped modern kitchen, complete with fully automatic espresso coffee machine. Two luxurious bedrooms with king beds, two deluxe bathrooms and an expansive timber deck with heated outdoor Jacuzzi. 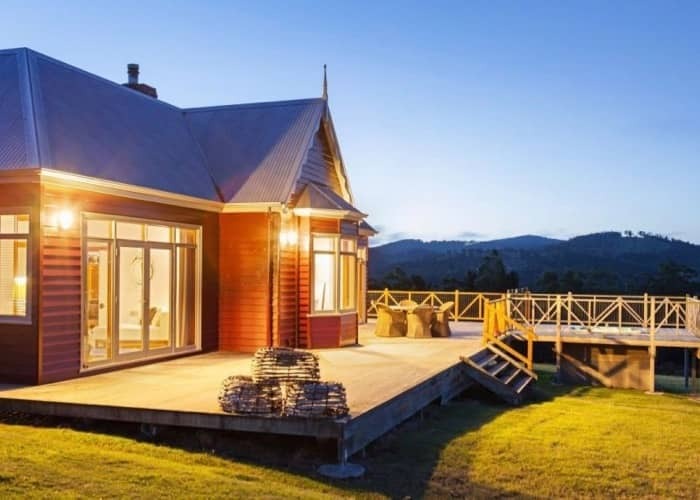 Enjoy a hot tub under the stars or a handpicked Tasmanian wine by the fire in this stunning farmhouse on the Peninsula. Please note: the third bedroom in the house is simply locked off during the guests stay. Experience ultimate luxury and seclusion in a truly magical setting surrounded by 250 acres of rolling hills, forest and wildlife. The Peninsula Cape House offers breathtaking 360 degree views across the D Entrecasteaux Channel, from Bruny Island and Port Esperance Bay to the magnificent mountains of La Perouse and Adamsons Peak. The stunningly renovated turn of the century farmhouse features huge lounge and dining areas with a wood burning fire and a fully equipped modern kitchen, complete with fully automatic espresso coffee machine. Three luxurious bedrooms with king beds, two deluxe bathrooms and an expansive timber deck with heated outdoor Jacuzzi. 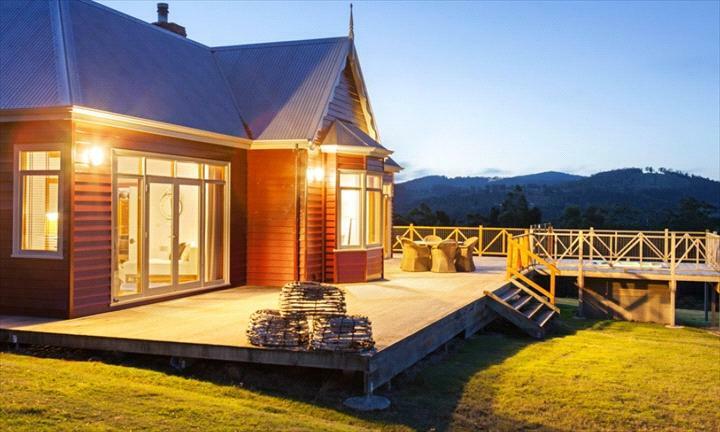 Enjoy a hot tub under the stars or a handpicked Tasmanian wine by the fire in this stunning farmhouse on the Peninsula. An Exclusive hideaway, The Boat House is one of just two accommodations on on this private peninsula with 250 acres of wilderness, wildlife, and surrounding waterfront to explore. The Boat House provides an indulgent romantic getaway just for two. Featuring a king bedroom, decadent bathroom, contemporary lounge, flatscreen TV/DVD player, WiFi available and dining area with stunning water views. This is an accommodation experience to be savoured - take in the breathtaking views from the expansive private deck complete with a private barbeque and hot tub for two! Self cater with a fully equipped modern kitchen, mini bar with local wines and produce, or relax by your cosy wood fire. Off street parking available.